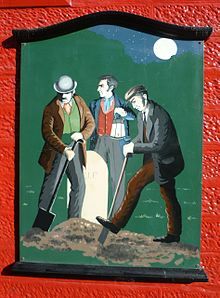 Body Snatching was the removal of bodies from graveyards, usually for the purpose of using the corpses as cadavers for the 19th Century medical schools. Those who practiced body snatching were referred to as resurrectionists or resurrection-men. As opposed to grave robbery, which involved robbing a tomb or crypt to steal artifacts or the corpse’s personal effects, body snatchers dealt in bodies for sale. Before the Anatomy Act of 1832, the only legal way for medical schools to have bodies for anatomical purposes in the UK were those condemned to death and dissection by the courts. Those sentenced for harsher crimes were often condemned to dissection. Such sentences did not provide enough subjects for the medical schools and private anatomical schools (which did not require a licence before 1832). While during the 18th century hundreds had been executed for trivial crimes, by the 19th century only about 55 people were being sentenced to capital punishment each year. However, with the expansion of the medical schools, as many as 500 cadavers were needed. Before electric power to supply refrigeration, bodies would decay rapidly and become unusable for study. Therefore, the medical profession turned to body snatching to supply the deficit of bodies fresh enough to be examined. Stealing a corpse was only a misdemeanour at common law, not a felony, and was therefore only punishable with fine and imprisonment, rather than transportation or execution. The trade was a sufficiently lucrative business to run the risk of detection, particularly as the authorities tended to ignore what they considered a necessary evil. Body snatching became so prevalent that it was not unusual for relatives and friends of someone who had just died to watch over the body until burial, and then to keep watch over the grave afterburial, to stop it being violated. Iron coffins, too, were used frequently, or the graves were protected by a framework of iron bars called “mortsafes,” well-preserved examples of which may still be seen in Greyfriars churchyard in Edinburgh. One method the body snatchers used was to dig at the head end of a recent burial, digging with a wooden spade (quieter than metal). When they reached the coffin (in London the graves were quite shallow), they broke open the coffin, put a rope around the corpse and dragged it out. They were often careful not to steal anything such as jewellery or clothes as this would cause them to be liable to a felony charge. The Lancet reported another method. A manhole-sized square of turf was removed 15 to 20 feet (5 to 6 m) away from the head of the grave, and a tunnel dug to intercept the coffin, which would be about 4 feet (1.2 m) down. The end of the coffin would be pulled off, and the corpse pulled up through the tunnel. The turf was then replaced, and any relatives watching the graves would not notice the small, remote disturbance. The article suggests that the number of empty coffins that have been discovered “proves beyond a doubt that at this time body snatching was frequent”. During 1827 and 1828, some Edinburgh resurrectionists including Burke and Hare changed their tactics from grave-robbing to murder, as they were paid more for very fresh corpses. Their activities, and those of the London Burkers who imitated them, resulted in the passage of the Anatomy Act of 1832. This allowed unclaimed bodies and those donated by relatives to be used for the study of anatomy, and required the licensing of anatomy teachers, which essentially ended the body snatching trade. The use of bodies for scientific research in the UK is now governed by the Human Tissue Authority. This entry was posted in British history, gothic and paranormal, legends and myths, real life tales, Uncategorized and tagged Anatomy Act of 1832, body snatchers, grave robbers, medical schools. Bookmark the permalink. Were there a lot of issues with animals digging up remains? That doesn’t seem very deep at all! Not so much in village cemeteries, Angie, but some graves were disturbed in the rural areas. Bodies were wrapped in blankets. Even if a coffin was used for the ceremony, that didn’t mean that it was used for the burial. Some people “rented” the coffin.